Last weekend (Labor Day Weekend), Lisa and I traveled to my hometown of Arthur, IL to spend time with my family. 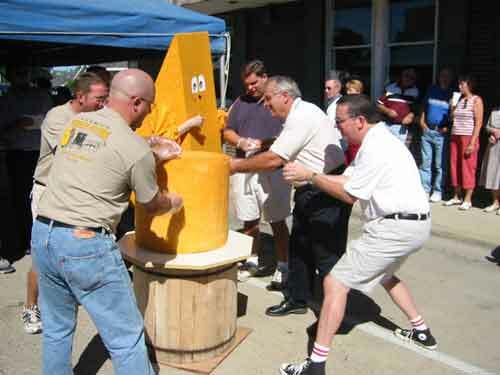 Every Labor Day Weekend, Arthur is home to the Cheese Festival. My family knows Lisa and I love to run in races and told us there would be a “Rat Race 5K” run on Monday morning…Fitting for a cheese festival. We didn’t decide really until Monday morning that we would run since Lisa was sick on Sunday night and we had run Sunday morning as well. 5K’s have been one of the more challenging runs for me even though you would think the short distance would make them easy. My problem has been – start off too slow, not enough miles in the race to make up for the slow start. Start off too fast, practically die at the end. So in order to overcome these obstacles I cheated eavesdropped. I overheard a guy behind me telling someone his best time was around 22 minutes and he was hoping to do at least that. My best before Monday was around 23:25. The race started and I drafted this guy for the first mile. My first split was 7:00 mile, right on pace for a PR. Between mile 1 and 2 my “pacer” started to slow down so I passed him and started my own pace. My mile 2 split 7:10, slowed a little but still on pace. The last 1.1 miles I started to fade a little but was able to run “fast” enough to finish in 22:18…I think. I still haven’t seen the official results but I think that was what was on the clock when I crossed the finish line. My reward…a block of cheese and gatorade. ~ by jmm2 on September 7, 2008. Congrats on the PR!! Amish cheese.. . . aaaahhhhh!!! What a great reward 🙂 Seriously, the stuff is much loved at our house and highly requested when it is on hand from Grandma.